When you select a route in TrailRunner mini, the course is displayed in the map. But sometimes you may want to permanently display the route in the map, e.g. for planning alternatives or by making them visible as your path to follow when using RaceBunny while you are on your way biking or hiking. With TrailRunner mini 3.6 and above, you can add additional notes and attachments to routes. These are multiple images, text fragments and links to websites or any file on your hard drive. To use this feature, select a route. In the right info area select the notes icon. Then either drag anything into this area or add a container by clicking the top right + icon. Once you have added multiple containers you may reorder them by clicking and holding within the background area of a container until the container starts hovering and then dragging the container to reorder it. This feature is free to all users that have bought a subscription and for users that have bought a lifetime license for TrailRunner mini 3.6 and above. Users that have bought a license prior the 3.6 release have to buy a subscription. Problem: You have imported a course recording and want to edit the course. Files imported in the format GPX, KML, TCX or FIT are typically recordings. These recordings are immutable in a way that they contain many recorded points with no logical connection to the OpenStreetMap network that underlies the TrailRunner mini routing editor. So when you try to edit such a route, TrailRunner mini gives you the option to create a routable approximation of the route by guessing good transit locations that resemble the original as much as possible. You can even choose to display the original recording as a background route to compare and make corrections to the approximation. If you prefer to retrace the imported route from scratch you may also mark the imported route as flagged and start creating a new route. Flagged routes are always visible in the background. Then manually place and move your transit pins as needed. How can I import GPS Recordings from my Sports Watch? How can I transfer routes to my iPhone? 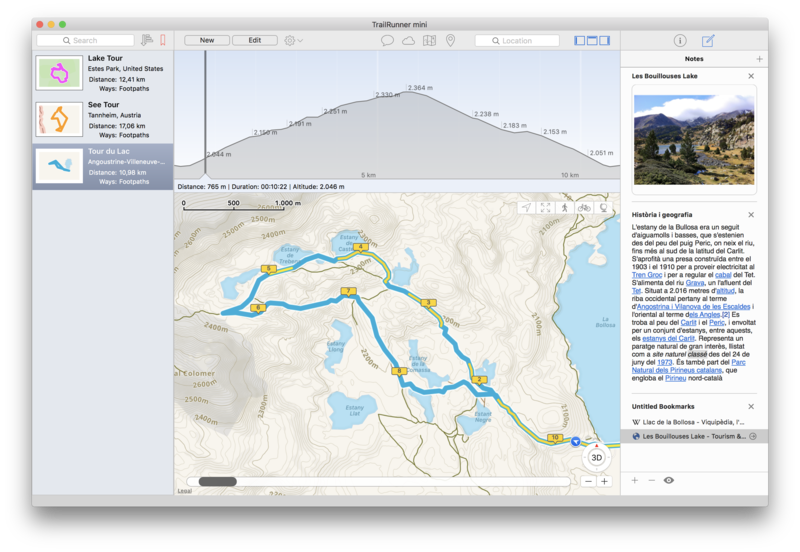 TrailRunner makes use of Apple iCloud to synchronize routes between all of your devices like iPhone, iPad and Mac. RaceBunny for iPhone can display routes planned in TrailRunner. If you go out for a hiking trip you can place one or more routes as a background route on your map. While you are walking, you see where you are and where you possibly should be. To use route synchronization with RaceBunny just make sure all of your devices are set up for Apple iCloud. Then create a route on any device and the route will automatically appear in RaceBunny on your iPhone. - All your routes are now available in RaceBunny. You now see your route as a background route in the map. Add more such routes if you like. You can directly scroll the map to the beginning of the last flagged route by taping on the carrot icon. Please also note that when you flag a route in TrailRunner it is — after the sync is through — automatically flagged in RaceBunny and therefore displayed as a background route. Same goes for colors assigned to routes in TrailRunner. When you change or create a route in TrailRunner, it may take several minutes until the route appears in RaceBunny. So synchronize RaceBunny regularly to get the update. To conserve battery power and network traffic, RaceBunny does not automatically update routes and you always have to synchronize them manually. How can I organize my routes in folders or collections? Problem: you have a lot of routes and want to organize these in folders or collections. How can I create off-road routes? Problem: TrailRunner mini uses the openStreetMap way network create routes along the transit locations you set. But sometimes the openStreetMap data is not complete or you really want to go off-road. Solution: In the left editor panel, turn on the off-road switch. All now placed transit location pins are now green off-road pins that no longer follow the openStreetMap network. As an alternative, while moving or adding a transit-location, hold the (Command / ⌘) key down to place an off-road transit location. TrailRunner mini will then create a straight connection between the last transit location, the green off-road transit location and the upcoming transit location. HowTo: Watch this video guide on how this works. Contribute: To improve the mapping coverage of this area, you may want to contribute to the openstreetmap.org project. 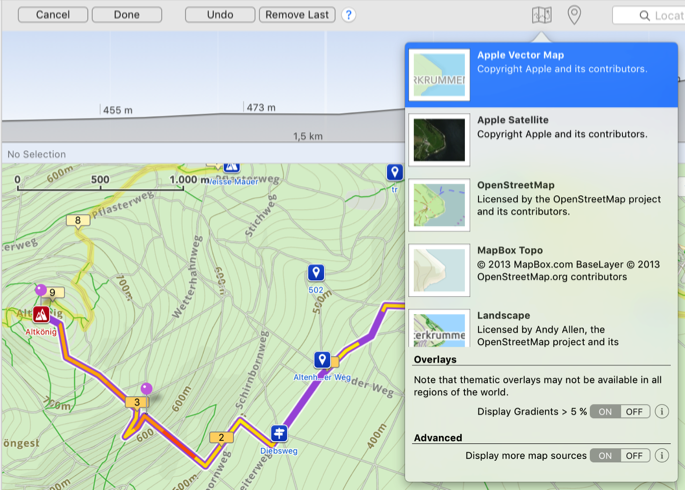 Layout the "missing link", export a GPX file and upload it to the openStreetMap network. It may then take up to two weeks until the track is available within TrailRunner mini. If that's not the case, remove the TrailRunner mini Cache from your hard-drive. How can I print maps and routes? TrailRunner mini does not support printing of maps and routes. But you may help yourself by taking screenshots and then printing these. To learn more, read Shortcuts for taking pictures of the screen. Hint: You may also create a Keynote™ presentation and to paste the screenshots there. Within the keynote booklet you can add more details on your route like hotels, stops and phone numbers you may require during your trip. How can I synchronize routes with my iPad? Besides TrailRunner mini for Mac OS X you can get TrailRunner touch for iPad on the AppStore. Both apps have almost identical features and can synchronize routes using iCloud. How can I view my routes in GoogleEarth? Problem: You have a route and you would like to view the route in 3D using GoogleEarth. Solution: Download and install the latest version of GoogleEarth. Then export the route and import the GPX file in GoogleEarth. It is now being displayed in the list of temporary locations on the left. Open the structure there and check only the track to be displayed. Tip: In an upcoming release of TrailRunner mini the option 'View in GoogleEarth' will be available. How can I move the aspect of the background map? Problem: I have a Mac without a Multi-Touch trackpad or a Magic Mouse. How can I easily move the background map if I have a mouse with only a scroll-wheel or no scrolling capabilities at all? To move the aspect of the background map, click and hold until the hand cursor appears. Keep holding and move the mouse to change the aspect. To zoom into a location, double-click the location. 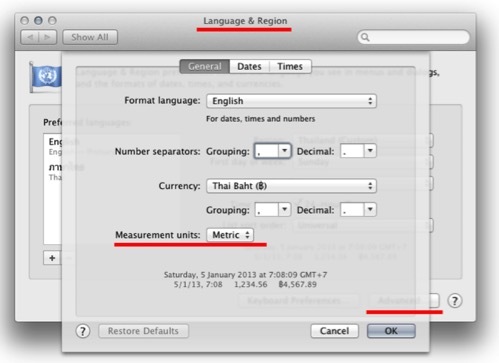 Use the key combinations ⌘+ and ⌘- to zoom in and out at the center of the background map. On Multi-Touch capable input devices use the gestures to zoom and scroll in any direction. Problem: you have a question you cannot solve on your own my reading this FAQ. How can I contact you? Solution: Within the application, use the Feedback menu item to open a mail message addressed to me. You did not find answers to the questions you have? Or you have additional questions and remarks? Then please use the application feedback within TrailRunner mini to get in touch with me. Please note that I can only help you, if you contact me directly. Your feedback is valuable and must reach my brain, not the internet. Otherwise a bad review on the App Store will only lead to frustrations on my side that may stop further development of TrailRunner mini, which would be sad. But if you are happy with TrailRunner mini and also like the support I give, I would highly appreciate your short review and some stars on the App Store.